It started with Monday. But it doesn't end with Sunday. Read Sunday Silence, the new novel in the series that LOUISE PENNY calls "fabulous, unsettling, and riveting" -- and brace yourself for the breathtaking series finale in summer 2018. Lover of London, gifted psychologist, frequent police consultant -- Frieda Klein is many things. And now she's a person of interest in a murder case. A body has been discovered in the most unlikely and horrifying of places: beneath the floorboards of Frieda's house. Crackling with suspense, packed with emotion, Sunday Silence is a psychological thriller perfect for fans of Elizabeth George and Paula Hawkins. Lover of London, gifted psychologist, frequent police consultant--Frieda Klein is many things. And now she's a person of interest in a murder case. A body has been discovered in the most unlikely and horrifying of places: beneath the floorboards of Frieda's house. The corpse is only months old, but the chief suspect appears to have died more than seven years ago. Except, as Frieda knows all too well, he's alive and well and living in secret. And it seems he's inspired a copycat . 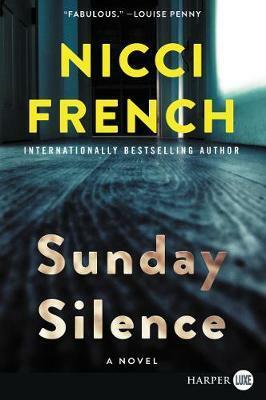 . .
Crackling with suspense and packed with emotion, Sunday Silence is a psychological thriller perfect for fans of Elizabeth George and Paula Hawkins.